In this guide I will explain what WHMCS is, and guide you on the basics of how to use it. Resellers may request one WHMCS license at no additional charge via AMP at no additional charge. You can access a Live Demo of WHMCS here. You can also access the official WHMCS How-to guides here. We will now show you how to accomplish the most common tasks in WHMCS. Do you want to sell hosting services with your own brand? InMotion Hosting provides Reseller Hosting solutions that meets your needs! Access the website you installed WHMCS on, and add a: /admin to the end. 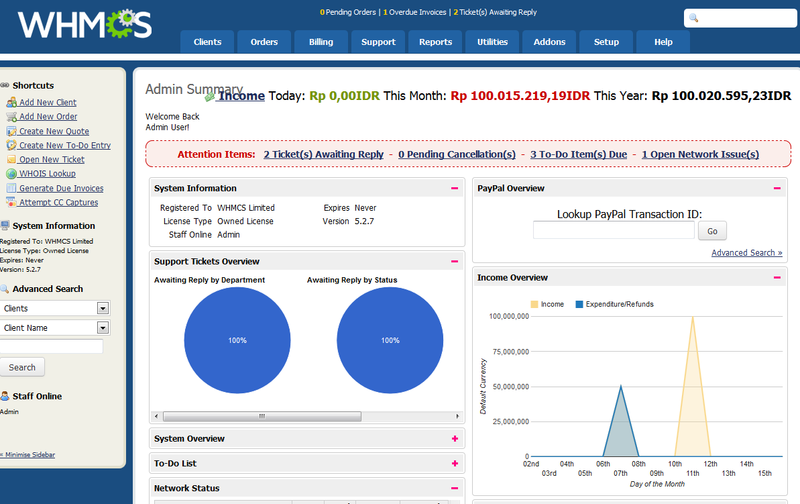 For example if you installed WHMCS on: example.com, you would navigate to: example.com/admin to access the admin login page. You will then be logged into the Admin area. 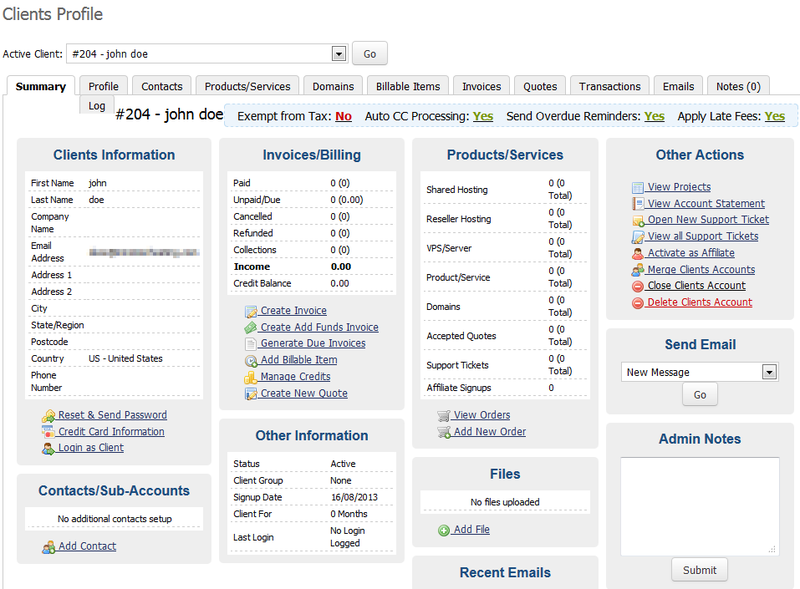 Login to the Admin area in WHMCS. In the navigation menu, roll your mouse over Clients, then click Add New Client..
On the Add New Client menu, fill in the contact information for your client. If you want an email notification sent to the customer, click the check box next to Tick this box to send a New Account Information Message . Click the Add Client button to save what you entered. You will then see summary of the profile you created. 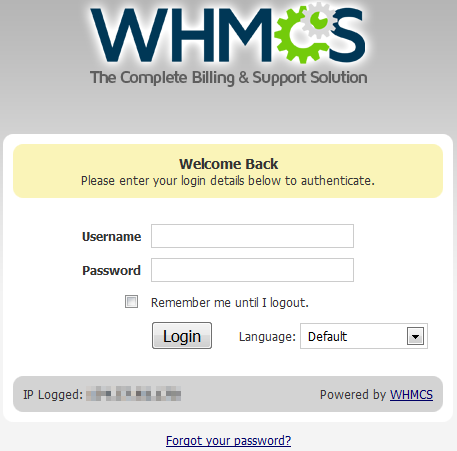 Login to the Admin section of WHMCS. In the navigation menu, roll your mouse over Clients tab, then click View/Search Clients. Click the name of the client, who owns the domain you want to manage. As per the official WHMCS documentation, “You'll also see a row labelled Registrar Commands with options such as Renew, Modify WHOIS, Get EPP Code, etc...” Clicking those options allow you to make changes with their registrar. Hi, you can use our guide "How to Connect WHM to WHMCS" to setup the server in WHMCS. I recommend checking out our Product Guide section for Reseller Hosting to learn more about setting up WHMCS under the 10 Steps to Automation section heading. Which WHMCS package comes with your reseller accounts? I notice they range from 250 clients to unlimited. Our reseller package is the base level package, but our customers do have the option of upgrading their package with WHMCS. Here is a helpful link to the official documentation on Upgrading WHMCS. As a reseller, how do I sell a domains to my client. I have signed up on http://imhstore.com/. How do I integrate that into WHMCS? Congratulations on becoming a reseller, you will want to check out our guide on connecting WHMCS with eNom from our Reseller Product Guide. The live demo of WHMCS no longer works. I have installed WHMCS in its own directory (mydomain.com/whmcs) and now I want to move it to the root (mydomain.com). What do I need to do to achieve this? We do not currently have any documentation on how to do that. I did find a video on YouTube that you may be able to follow. It is quite old. however so I cannot say whether it will work for your specific version. For the domains registered directly with InMotionHosting through AMP ,, is it able to add a registrar for them to be managed with WHMCS ? I'm not quite understanding what you mean. Any domain registered through us is with Melbourne IT as a registrar. Our reseller account holders are resellers for Enom. Those are the two registrars we deal with. What were you specifically trying to accomplish? Please check to see if you have any of the ResellerClub Hosting modules installed, if so please disable them as there seems to be a problem between them and the core WHMCS installation that is producing this error. Thank you for contacting us. Here is a link to a similar post in the official WHMCS Support forums. They discuss possible solutions to the issue, that may help troubleshoot. What is this error Im getting while adding a New Server at WHMCS? inmotion support and WHMCS support didnt help me properly, I am stuck with this problems more than 2 days. Are you sure the username you are putting in has WHM reseller access? The error is stating that the user you are putting in does not have WHM access at all. I just installed WHMCS and when saving changes, I either get a blank page or a connection was reset message on the web-browser. I enabled reporting for the blank pages and this is what appears. That particular error shows up when trying to add a product and clicking on continue (configproducts.php). I've been reading on WHMCS support and it appears that it may be due to an older version of IonCube being used on the web server. You will want to contact our Live Support to evaluate your server's setting and see if they can assist you with your specific account. I also having this problem as well, I've been suspecting might be the MySQL Strict Mode Causing the issue, however InMotion Team insist not to disabled it for me, even when WHMCS requirement is to have it disabled. I found it quite ridiculous when offering WHMCS as a main features for reseller, but providing a non working one for us. I agree completely... This was one of the main reasons for selecting InMotion and I have been unable to use the software. InMotion Support was unable to resolve my issue and recommended I contact WHMCS directly. This is not possible, since I am a customer of InMotion and not WHMCS, so I cannot even create an account to request support. Either way, I do not have access to these server settings, so there is nothing I can do to resolve this myself. It would be pointless to contact WHMCS support. I apologize for the responses you received. I installed WHMCS on your account in the test folder and it did load up for me with no errors and was wondering how I could replicate the PHP error. Hello TJ,I wish I would have posted here before contacting support! I worked with them for a few days on this and it was even escalated, with no resolution. I was basically told to contact WHMCS, which I could not since in order to contact support, you need to have purchased a license directly from them and my license was issued by InMotion. I wont go into much detail here, but you can look at my support tickets and see for yourself. I appreciate you looking into this so quickly and willingness to test this for yourself! Can you provide the url to your WHMCS installation so we may take a look into it? I use WHMCS on our servers and I have never seen this error so I am intrigued and would like to try and solve the problem. I want to ask ... how to use WHMCS in android app...... in login or Sign up ....??? Are you having issues logging into your WHMCS admin app on your android phone? We need a little bit more information about the current problem. How do we integrate WHMCS to our website? is that a valid question? The WHMCS (Web Host Manager Complete Solution)is a software application that is designed to work through the web, but in its own interface. If you were to integrate it into your website, then you would need to either simply link to it, or hire developers who can design a custom WHMCS interface for you that you can include in your website.